Particularly good at removing cat and dog hairs off carpets; Easily washed to keep clean; rubber bristles for all floors types indoors and out. 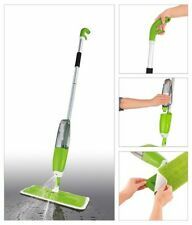 Plus useful floor squeegee and cloth mop holder. The handle IS NOT INCLUDED. This multi duty holder can be used to hang sporting goods, hardware tools, cleaning tools, kitchen tools etc. Great choice with Internal friction grip and hook for more purposes. 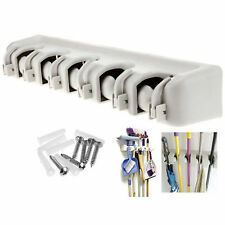 This multi duty holder is used to hang sporting goods,hardware tools,cleaning tools,kitchen tools etc. The Dust Magnet Electrostatic Mop be used on all your smooth dry surfaces, especially suitable for laminate, wood floors, vinyl and linoleum. Screw together handle. The cloths supplied can be used as hand cloths for general dusting but are NOT suitable for use with water or household cleaners. Here we have an industrial flat floor mop, ideal for cleaning large areas of hard flooring quickly. 360 Degree Swivel Action. Machine washable head - no expensive refills. 24" 600mm Wide Head. Easy to use. Use as a Broom. Removes Pet Hair From Carpets. Extendable Handle. Rubber Bristles. Get more done around your home with this pair of Slipper Genie microfiber cleaning slippers in pink for women, which allows you to keep your hard floors clean while simply walking through your home. Perfect for wood, tile, and vinyl floors, these slippers feature fluffy microfiber fingers on the soles that grab dog hair, gather dust bunnies and collect dirt. And because of their size and shape, these slippers can go where a broom or mop might not reach. A hook and loop fastener attaches the cleaning cloth to the slipper, and it can be easily removed from the slipper to shake dust and dirt off before more cleaning. One size fits most. For use only on dry floors. Machine washable. Made in China. 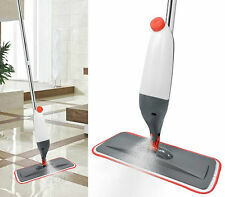 Say no to dirt with a 360 degree micro-fiber turbo dual spinning mop! 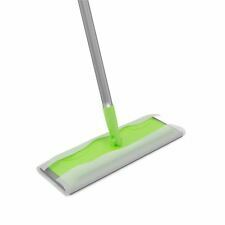 Mopping is fast and easy with the Spin Mop Cleaning System with Bucket and Microfiber Mop. With the spinning action, your hands never have to touch the mop head! AND Personal Friendly Service Too! Colour:Blue The trigger spray mop is the ideal household item. 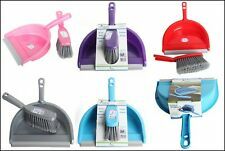 Tired of carrying a mop bucket around why not try this amazing spray mop. The spray mop allows you to spray cleaning solution simply with a press of the trigger, this then allows you to simply mop it up giving you pristine clean floors. Stiff bassine material ideal for outdoor use. Strong wooden handle to provide an excellent sweeping motion. Strong bracket to provide extra support to the handle. Soft cream PVC bristles. Heavy-duty Lids Off Jar Opener -Best Value Arthritis Jar Opener. Colour random. Polished Wooden handle. Apollo Housewares 29.5 x 14 cm Rubberwood Banana Tree, Natural Wood. Blackspur BB-CS109 Baby and Child On Board Car Sign. PVA Sponge Mop. PVA Sponge absorbs far more water than your average mop. Pull handle to squeeze out liquid. Green & Silver Handle with Yellow Sponge. Weight: 0.7 kg. Product Specification. Addis Vigar Flower Power Handy Dustpan And Brush Set, Green/Pink. Condition is Used. Dispatched with Royal Mail 2nd Class. Used once on a camping trip and in excellent condition. Lime green and pink in colour. Decided to go with a hand vacuum instead. In The Box Scot Young Research (18oz) Socket Mop Head. Product Type: Socket Mop Head. Product Type Socket Mop Head. Form Factor Mop Head. Colour Green. Colour coded. White yarn and coloured socket. White yarn and coloured socket. Mopping is fast and easy with the Spin Mop Cleaning System with Bucket and Microfibre Mop. 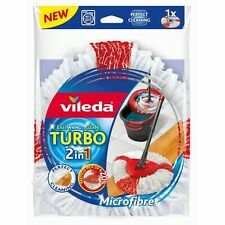 360° rotating super absorbent microfibre mop heads. Say goodbye to dirt with this360° Spinning Magic Floor Mop and Bucket Set ! The handle extends to up to 97.5cm to reach higher locations as well as lower down, eliminating the need to bend or over stretch. The head has 2 interchangeable cleaning tools. 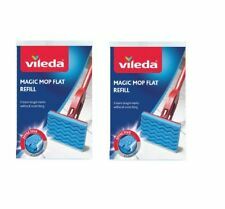 The Microfibre pad has a removable cover and is ideal for glass and soft surfaces. Duck shape scrubbing brush in stylish. Duck Shape Scrubbing Brush. Quirky washing up brush.